Today, I learned that I am exactly No good at names. Three hours of brainstorming titles. Can you see the picture attached? A drop in the ocean. I cannot do brainstorming. Think, and act, and go. Does that name make sense yet? Am I giving too much away? So, hey, wow. Puuba is a thing. Operation: Big Dumb Gamble is a Go for launch. I mean… Puuba’s always been a thing. It’s just, now it got really official. Corporate. Less “just in our hearts and minds“. In fact, Puuba is now officially “Puuba, Inc.” Though… I think we can still just call it “Puuba”. We’ve all earned that much. This week marks the end of the first week of our first week. Honestly, we got a shocking amount of material done. If I were the type of guy to use a Gantt (which I am), I might have pulled that Gantt up by as much as a whole week. 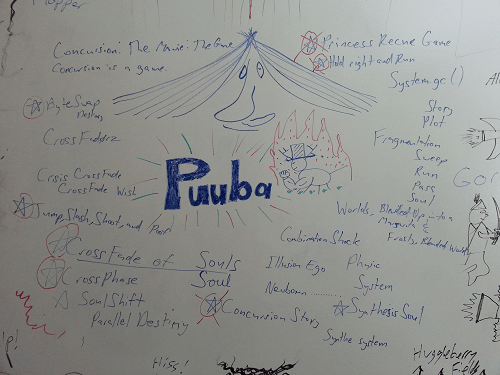 Our plot is drafted (mostly); our characters exist; and we have a lot of drawings all over the walls. Did I mention that our office wall is made of “White Board Stuff”? This week is dedicated to web design and broad level strokes. But, I’m more excited for next week, where the programming starts. Then, we get to play, and call it work. Not that that means that you get to play our game much earlier. Good things come to those who wait and pay.